Thyroid orbitopathy, thyroid-associated orbitopathy or Graves' orbitopathy, thyroid-related inflammatory orbitopathy, and dysthyroid ophthalmopathy are varied terminologies used to describe the ocular manifestations of thyroid eye disease.,, The pathogenesis of the disorder is poorly understood. Considered to be an ophthalmic autoimmune disease, it is usually associated with hyperthyroidism and may occur in euthyroid as well as in hypothyroid individuals. It also can occur with Hashimoto thyroiditis (immune-induced hypothyroidism). Usually, the manifestations are bilateral [Figure 1] and [Figure 2] or may start as unilateral and later progress to bilateral. These can present as exophthalmos or lid retraction or a combination of both or inflammatory reaction with conjunctival congestion. Decreased vision can occur either due to optic nerve compression in less than 2% of eyes, by crowding of the apex of orbit by enlarged extraocular muscles and increase in volume of fibro-fatty tissue, or exposure keratitis. Enlargement of extraocular muscles with restriction of movements can also lead to diplopia. Among patients with thyroid-associated orbitopathy, approximately 90% have Graves' hyperthyroidism, 1% has primary hypothyroidism, 3% have Hashimoto thyroiditis, and 6% are euthyroid. The orbitopathy has also been classified as noninfiltrative and infiltrative, based on which the manifestations differ. This is a report of cases either with uniocular exophthalmos alone or isolated lid retraction only. The successful surgical treatment procedures also reported. In these patients, the surgical correction was performed due to cosmetic disfigurement and psychosocial problems. Mrs. L, aged 32 years, noticed lid retraction in the right eye only, over a period of 1 year [Figure 3]; as the staring look became obvious, the inquisitiveness of relatives, family members, and neighbors caused psychological trauma preventing her from attending social functions. Thyroid evaluation proved to be negative, and no neuro-ophthalmic conditions could be attributed. Lid lengthening by scleral graft interpositioning was done  [Figure 4] and [Figure 5]. Surgery was performed under peribulbar anesthesia. Skin incision was done along lid crease. After exposing and separating the orbicularis muscle, the tarsal plate was identified and the levator muscle was split along its border. A scleral graft of about 5 mm in width and 1.5 cm in length was interposed and suturing done with 5 'O' Vicryl. Even after 15 years of follow-up, she did not develop similar manifestation in the opposite eye. Mr. K, aged 45 years, reported with unilateral proptosis of the left eye only [Figure 6] persisted over a period of 2 years. He underwent treatment with thyroid supplementation at different places. Computed tomography scan demonstrated an enlargement of medial rectus muscle in the affected left side [Figure 7]. 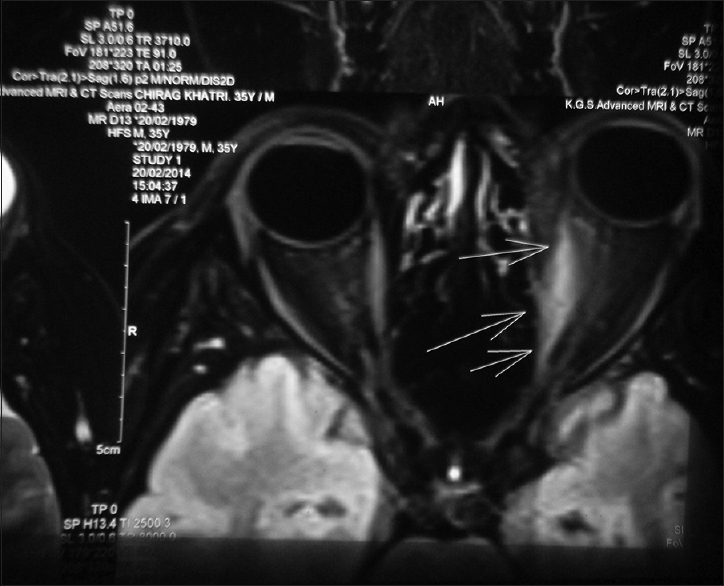 Orbital posteromedial wall decompression was performed by endonasal route by opening up the ethmoidal and maxillary sinuses [Figure 8]. The fibro-fatty tissue excised by transconjunctival route. 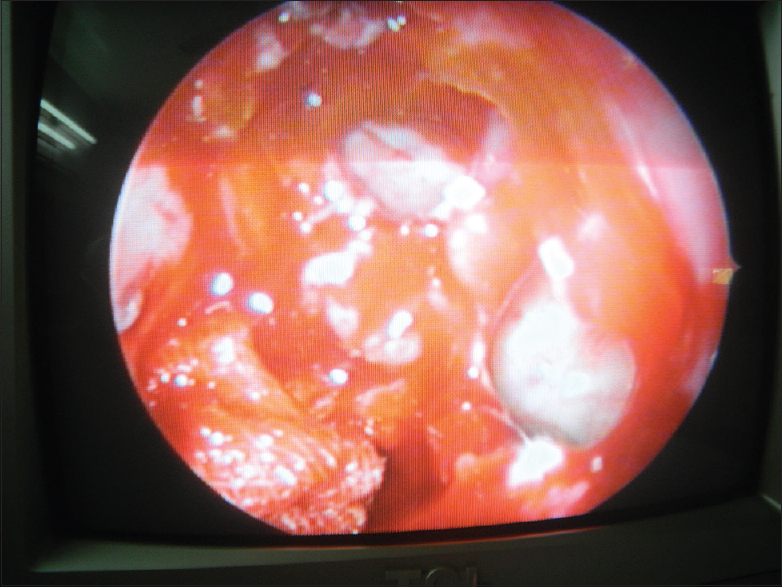 To facilitate further regression of proptosis, he was treated with steroids [Figure 9]. The concepts of pathogenesis and progression of thyroid eye disease are poorly understood. The clinical diagnosis of thyroid eye disease is done by comparison with previous photographs. Although smoking is considered to be a predisposing factor, none of our patients was smokers. Theoretically, orbital fibroblasts are supposed to account for the clinical features; bone marrow-derived fibrocytes may also account for the volumetric increase in orbital contents. Thyroid-stimulating hormone receptor and insulin-like growth factor-1 receptor are the two autoantigens that have already been recorded in orbital tissues and in peripheral blood, upregulated in these patients. Once activated, orbital fibroblasts deposit in between the extraocular muscle fibers. Production of inflammatory cytokines acts as chemoattractant of T-cells into orbit and adnexal tissues. Orbital fibroblasts may also differentiate into myofibroblasts and adiposites resulting in an increase in amount and volume of orbital fat causing volumetric changes. Activated T-cells, by inducing B-cell differentiation, also activates monocytes and macrophages, which in turn propagate the autoimmune and inflammatory process in thyroid eye disease. Some authorities believe that the serum titers of thyroid-stimulating hormone receptors may correlate with the course and activity of thyroid eye disease. These mechanisms may explain the various clinical manifestations such as congestion, proptosis, eyelid retraction, and fibrosis with restriction of extraocular muscles. Various classifications are used to grade the clinical presentation of thyroid eye disease. Werner's NOSPECS Classification of Grave's Ophthalmopathy is given in [Table 1]. More detailed classification is given by Jack Rootman. We have recorded cases where thyroid eye disease was noted in one eye only, and during subsequent visits also, the other eye did not develop similar manifestation. Case no 1 was followed up for 15 years; she did not develop lid retraction of the other eye. Case no 2 has been followed up for 1 year, and no manifestation was noticed in the opposite eye. When the very mechanism of thyroid eye disease is still being debated, the case of uniocular presentation is more puzzling. Several patients visiting many doctors for the thyroid eye problem start researching themselves as they get controversial views and opinions, their anxiety and surprise further increase their proptosis. Thyroid eye disease does not follow any fixed pattern of manifestations in different individuals. It is highly unpredictable as to which manifestation will occur in any given case. Exophthalmos, lid retraction and inflammatory reaction, diplopia, extraocular muscle hypertrophy and exposure keratitis, optic nerve compression, and visual loss can occur without any correlation to thyroid status. It surprises us when it occurs uniocularly also, without further progression. The authors would like to thank Prof. Dr. Chellam Balasundaram PhD., (Rtd), Professor of Animal Sciences, Bharathidasan University, Trichirappalli and Dr. Sathyan Asaithambi M. B, B. S., for critically going through the manuscript and valuable suggestions. The authors also thank Mr. B. Athikannan of G. K. S. Computers for his secretarial assistance. Bahn RS. Graves' ophthalmopathy. N Engl J Med 2010;362:726-38. Rootman J. Diseases of the Orbit. Ch. 11. Philadelphia: Publishers J.B Lippincott Company; 1988. p. 241-80. American Academy of Ophthalmology. Basic and Clinical Science Course. Section 7. American Academy of Ophthalmology; 2010-2011. p. 46-54. Sundar G. Thyroid eye disease – An overview of current concepts and management. J Tamilnadu Ophthalmic Assoc 2015;52:804-13.